There’s a lot to love about fall: think tasty tailgating treats, in-season root veggies and, of course, apple and pumpkin-spiced everything. Because many autumn-inspired foods are loaded with sugar, sodium, or junky ingredients, I scoured the supermarkets to find delicious and nutritious items perfect for celebrating the season. 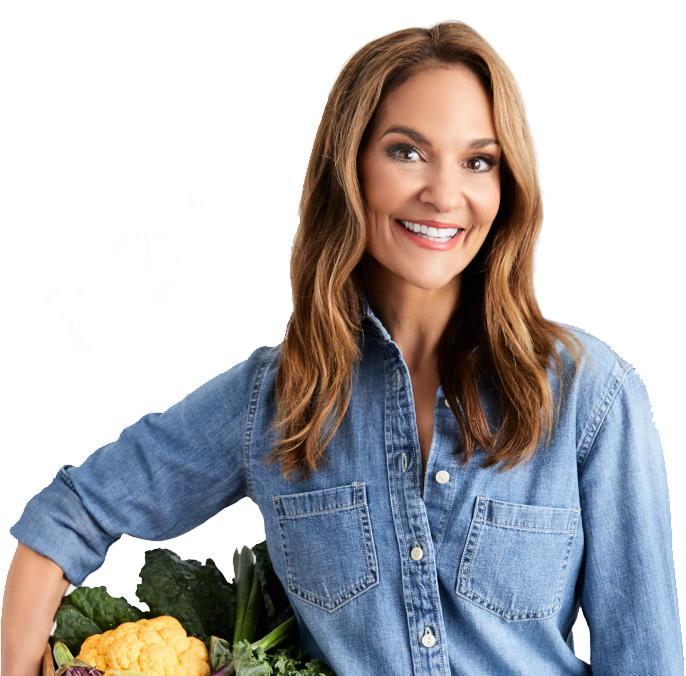 If you’re already sporting your favorite flannels and pair of boots, read on for my list of fall-flavored healthy food finds. Chobani offers delicious Greek yogurt in seasonal flavors, like Apple Cinnamon, Sunrisin’ Raisin, and Pumpkin Spice. They each provide 12 to 13 grams of protein with no more than 12 grams of sugar, which is pretty impressive for a flavored yogurt without artificial sweeteners. 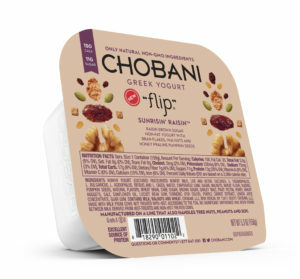 Try Chobani’s Apple Cinnamon Blended Yogurt, Sunrisin’ Raisin Flips and Pumpkin Spice Blended Yogurt. Kodiak Cakes and Flapjacked both make fall-flavored pancakes that pack some serious cinnamon-y goodness. Plus, they each contain whole grains—a rare find because standard flapjacks are typically made from refined white flour. Bonus: They’re packed with a satiating 14 to 20 grams of protein per serving, thanks to either whey protein, pea protein, and/or eggs. 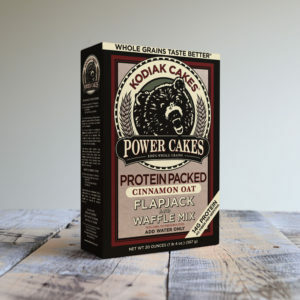 Try Kodiak Cakes’ Cinnamon Pancakes and Flapjacked’s Apple Cinnamon Pancakes. 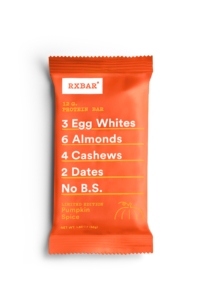 RxBars and LARABAR bars are handy snacks that are perfect when you’re on the go. 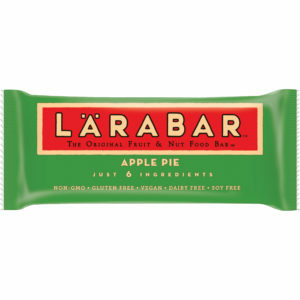 Each are made with real, wholesome ingredients like nuts and dates and clock in around 200 calories per bar. Chewy and delicious, their seasonal pumpkin and apple flavors are naturally sweet without any added sugar or artificial sweeteners. Rx Bars’ Pumpkin Spice, Apple Cinnamon, and Kids Apple Cinnamon Raisin. 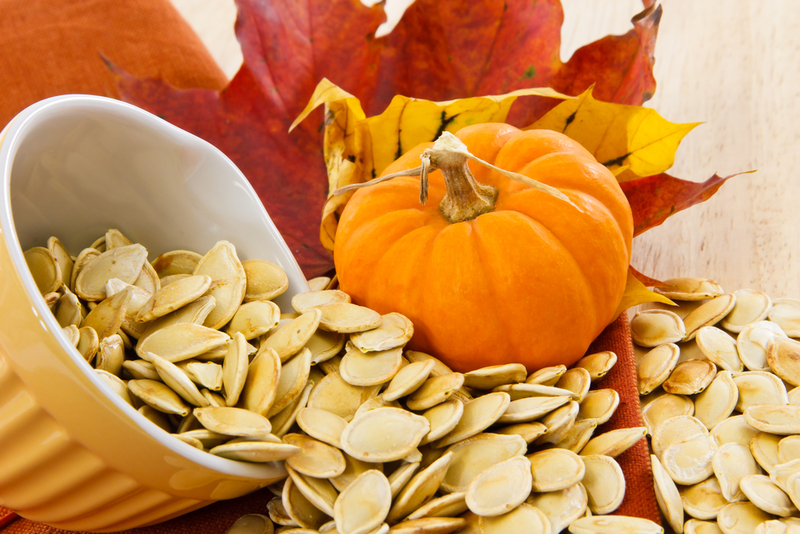 Pumpkin seeds pack a nutritional punch. In fact, they’re one of the richest plant-based sources of protein, fiber and zinc, an autumn all-star mineral that helps boost your immunity (just in time for cold season). 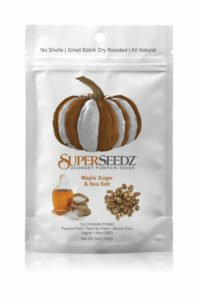 Superseedz Gourmet Pumpkin Seeds come in fun sweet-and-savory flavors like Cinnamon and Sugar, Somewhat Spicy, and Maple Sugar and Sea Salt. Already shelled, these seeds can be enjoyed on their own or added to oatmeal, salads and baked goods to bump up the nutrition. Try Superseedz’s Cinnamon and Sugar, Somewhat Spicy, and Maple Sugar and Sea Salt. Create your own fall flavors by adding pre-made pumpkin pie spice and apple pie spice blends to just about anything— think yogurt, oatmeal, coffee, healthy muffin batters or desserts (the sky’s the limit!). 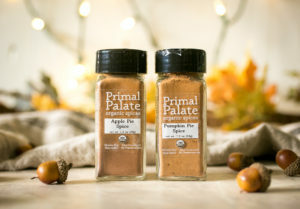 Primal Palate and McCormick’s Spices offer yummy blends made with seasonings like nutmeg, cinnamon, cardamon, and ginger. Get ready to add a dash of fall without a dash of sugar or calories. Try Primal Palate’s Apple Pie Spice and Pumpkin Pie Spice and McCormick’s Apple Pie Spice and Pumpkin Pie Spice. 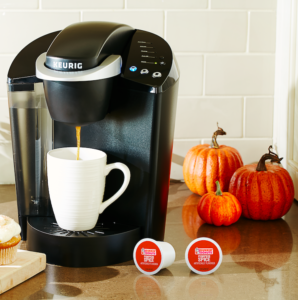 Starbucks, Dunkin’ Donuts, and Green Mountain Coffee each make ground coffee or K-cup pods that come in tasty pumpkin flavors. Brew up a cup of joe at home, then add a splash of milk for a indulgent-tasting bevvie without any extra sugar or junk. Try Starbucks’ Pumpkin Spice Blended Coffee, Dunkin’ Donuts’ Pumpkin-Flavored Blended Coffee, and Green Mountain Coffee’s Pumpkin-Spiced K-cup pods or ground coffee. Cider Tea for a delicious and cozy way to enjoy the festive flavors of fall. It’s a party in a mug ;). 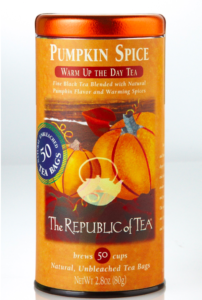 Try The Republic of Tea’s Pumpkin Spice Tea and Apple Cider Tea. In-season root veggies like butternut squash and sweet potato scream “fall.” They provide natural sweetness with a shot of nutrition—most specifically beta-carotene, which boosts immunity and promotes radiant skin. If you’re looking for healthy sides that take mere minutes to prepare, toss these three items into your shopping cart. First up, Pacific Foods’ Low-Sodium Butternut Squash Soup achieved the difficult task of creating a store-bought soup that’s free of cream, low-in-sodium, and packed with delicious flavor (seriously). Made with only good-for-you ingredients, Dr. Praeggers’ Root Veggie Hashbrowns will win a place at your dinner table. And, your kids will literally eat up Dr. Praeggers’ Sweet Potato Littles that come in fun shapes and taste like sweet potato fries. Ah-mazing! Try Pacific Foods’ Low Sodium Butternut Squash Soup, Dr. Praeggers‘ Root Veggie Hashbrowns and Sweet Potato Littles. For many, fall means football and tailgating season. 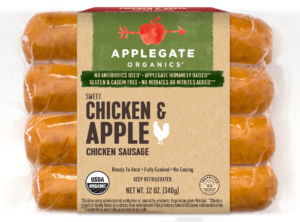 If you’re firing up the grill, Applegate’s and al fresco’s poultry sausages are terrific for game-day cookouts. They’re significantly lower in sodium compared to standard sausages, and they’re made from lean chicken, versus fatty pork or beef. Bonus: Both brands offer festive chicken and apple flavors—touchdown! Al Fresco’s Chicken and Apple Sausage and Buffalo Style and Blue Cheese Sausage. Crunch on this: Bare Snacks’ Apple Chips have just one ingredient, apples! Without a drop of added sugar, each ½-cup serving clocks in at 110 calories and 4 grams of filling fiber. Plus, they come in organic and non-organic varieties. Enjoy ‘em plain or with peanut butter for a snack you’ll fall for. 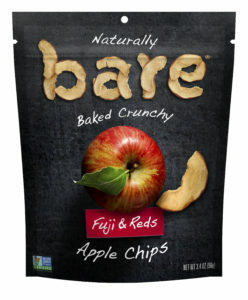 Try Bare Snacks’ Apple Chips and Organic Apple Chips. Why should humans have all the fall fun?! Give your puppies some pumpkin love with Charlie Bear’s tasty pumpkin dog treats. My furry daughter, Gatsby is digging them big time! 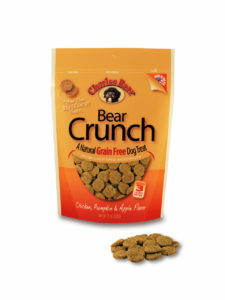 Try Charlee Bear’s Bear Crunch Pumpkin Dog Treats.